^ Cronquist, A. (1960). “The divisions and classes of plants”. The Botanical Review 26 (4): 425–482. doi:10.1007/BF02940572. ^ “20. Systematics of the Species Rich Algae”. ISBN 0-8493-9579-8. ^ Dawes, Clinton J.; Scott, Flora M.; Bowler, E. (1961). “A Light- and Electron-Microscopic Survey of Algal Cell Walls. 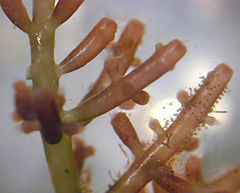 I. Phaeophyta and Rhodophyta”. American Journal of Botany 48 (10): 925. doi:10.1002/j.1537-2197.1961.tb11732.x. ISSN 00029122. ^ Le Gall L, Saunders GW (June 2007). “A nuclear phylogeny of the Florideophyceae (Rhodophyta) inferred from combined EF2, small subunit and large subunit ribosomal DNA: establishing the new red algal subclass Corallinophycidae”. Mol. Phylogenet. Evol. 43 (3): 1118–30. doi:10.1016/j.ympev.2006.11.012. PMID 17197199. http://linkinghub.elsevier.com/retrieve/pii/S1055-7903(06)00469-6.